This year my Mother’s Day will be so different than the last. Last year I told Ryan that I couldn’t bear to go to church and see all of the beautiful momma’s with their children celebrating what I had so desperately wanted and fought for. I couldn’t take the hugs and well intentioned words of encouragement telling me that “next year will be my year.” I had heard it too many times and smiled through it for too many years. Even in the midst of our adoption journey I just couldn’t do it. I had no idea when (or if) we’d ever be chosen. I knew I wouldn’t ever be pregnant. After 6 years of struggling and a lifetime of dreaming I just couldn’t face it. So we ran away for the day and went and did something fun, just the two of us. I understand the pain and heartache that infertility brings. I understand the isolation you feel and the hope that is so hard to hold on to—but you just can’t seem to bring yourself to let go of. I know the tears that come with each failed pregnancy test and the walls you build up a little higher each time someone asks, “why haven’t you two had children yet?! Time’s ticking!” This time last year my son was growing inside of the womb of another woman, and I had no idea that my life would be changing in a few short months. I had no idea that the prayers I had been praying were being answered as I cried and pleaded with God to not forget me. I could only see that another Mother’s day would be coming and going and I wasn’t a mother. This year I will celebrate with my precious son, my adorably handsome husband and this miracle baby growing inside of me. I will relax and let my husband take care of me and change all of the dirty diapers. I will thank God (as I do every day) for these precious gifts He has given to me. I will thank Him for both answered and unanswered prayers. I will snuggle with my boy and give him more kisses than I can count. But, in the midst of my own joy- I promise that I won’t forget those who are experiencing the gut-wrenching grief that is all too familiar to me. In my own joy, I won’t forget those women who desperately want to be called “mom” and struggle every day to make it happen. I won’t forget those who have given up hope that their mom-sized dreams will ever come true. I’ll think about those who have lost their mom and are experiencing the loss of the woman who made them who they are today. Those who have a broken relationship with their mom and struggle to smile through the day- I’ll hold you in my heart as well. So often in our own joy we can forget there are those who are suffering. We can forget that God doesn’t answer everyone’s prayers in the same way that He answered ours. I can look back on my story now and see His grace weaved through every unanswered prayer, but not everyone can see their story from the same perspective that I can. Not everyone has made it on the other side of their journey. Not everyone will, and I can’t say that I understand why. I do know that even in the mud and muck of life, that God is still ever present. He is still a God who LOVES us unconditionally and understands our tears and frustration and heartache. God is a God of hope! He isn’t finished writing your story. Trust Him with the beginning, the middle and the ending. Friend, when I say that the story He writes for your life is far better than anything you could write on your own, I say it because I know. I’ve lived it. I know it hurts. I know it’s hard. I know the temptation might be there to just give up, but don’t. Hold on to hope. God is still in the business of miracles. I’m sure those of you who have carried a child understand when I say that you can’t quite put in to words how you feel that first time you hear your baby’s heartbeat. After our scare the day we found out I was pregnant, I was afraid to hope I would ever hear it. On Tuesday that all changed. I knew things in the ultrasound looked different. I knew I hadn’t had any more issues with bleeding and Incoildnt remember the last meal I kept down. But the moment I heard that heartbeat this deep sense of relief and gratitude just overwhelmed me. This baby is alive and growing and I am just overwhelmed with gratitude and relief. I don’t think I’ll ever forget hearing Dax’s heart beating for the first time. We were so nervous waking into the hospital room where S Would soon be giving birth. It was the first thing I noticed when we walked in that room. It gave me such a sense of peace and security to listen to the rhythmic thumping on the monitor. It gave me a focus when things were quiet and hope when things felt tense. I still love it when Dax is laying on my chest and I can feel his little heartbeat against me. Hearing this baby’s heartbeat was different, but offered me a familiar sense of peace and security. For now, this baby is healthy and growing safe and secure. For now, we are rejoicing over this new life! 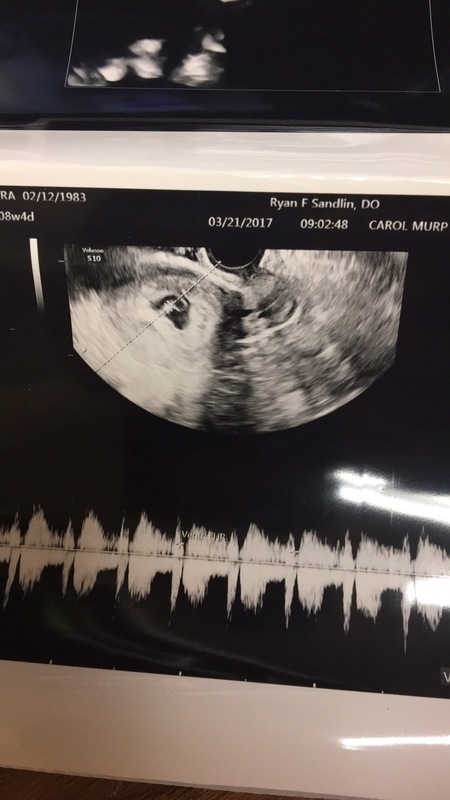 We’ve known about this new little “Rybean” miracle for nearly a week now and I feel like I can write about it a little more clearly. Trust me, the shock hasn’t worn off. I don’t know that it will wear off for quite a while! 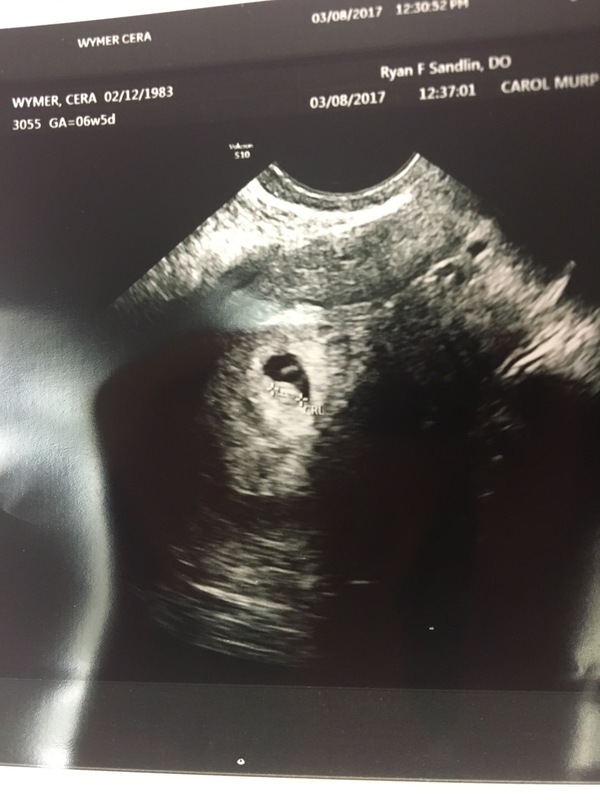 Part of me wants to just tell everyone I see- “Look what God has done! He has made life when no doctor thought life could be formed!” The other part of me is scared to speak it out loud too often. What if I lose this baby? Will I have the strength in my grief to then go back and say, “We lost our baby. This miracle life is now in heaven.” So for now, we tell our closest friends, our small groups at church and our immediate family. We hold our breath, and we pray that our Rybean will keep growing and we will meet in the Fall. We have experienced nearly 7 years of infertility and we felt confident in the fact that we would build our family through adoption. Sure, I mourned the fact that my body was broken and wouldn’t work in the way it had been designed, but I knew that biologically, it didn’t matter. I would love my children no matter how or when they came into our family. Being pregnant just 5 months post adoption (actually, 5 months TODAY!) seems surreal. This wasn’t supposed to happen. All of these changes are happening within my body and it’s CRAZY to try and keep up. My favorite thing about pregnancy so far is the dream’s I’ve been having. Oh MY GOODNESS. There must be a lifetime/Sci-Fi TV network just begging to break free in my imagination. I’ve dreamed up some pretty hilarious things (and unfortunately some disturbing scenarios too!) Each night I’m excited to go to sleep to see what will happen next. I’m also surprisingly not bothered by morning sickness (Fun fact for any guy who may be reading: Morning sickness isn’t reserved for only morning hours. Ryan was confused about me being sick all day. Sometimes, that’s just how it happens!) With the scary start to this adventure, Morning sickness comforts me and helps me feel like my hormones are raging which means the baby must be growing. I know there are no guarantees, but for now- it helps to ease the anxiety I’ve been experiencing. My least favorite thing about pregnancy is the anxiety associated with it. Because there are so many changes in my body and we have had one super scary experience so far, I’m hyper aware of every new thing my body is doing- be it real or imaginary! I’m in a constant state of “google” which is never wise when you want real medical advice…but I can’t help it. We certainly weren’t planning a baby this soon. We DEFINITELY didn’t plan on me becoming pregnant but now that I am pregnant, I already love this precious life more than I thought it was possible to love something you can’t feel or see. I guess it shouldn’t be a huge surprise to me. After all, I loved Dax in the same way when I knew we were expecting him via his birth mother and he was several states away. There’s no stopping this ride we’re on. We just have to hold on and trust. Haven’t I talked about how hard that is for me before? Apparently, God isn’t finished teaching me! He continued to worry so I offered to go to the store to get a test. We have done this countless times throughout our marriage. I wasn’t concerned. We have been married 7 years this month and we’ve never been pregnant. It seemed silly to “waste” money on a test. We did our best to fumble through our nightly routine and I obsessively dreamed up dreams for our potential new family of 4 and then talk myself off the cliff. 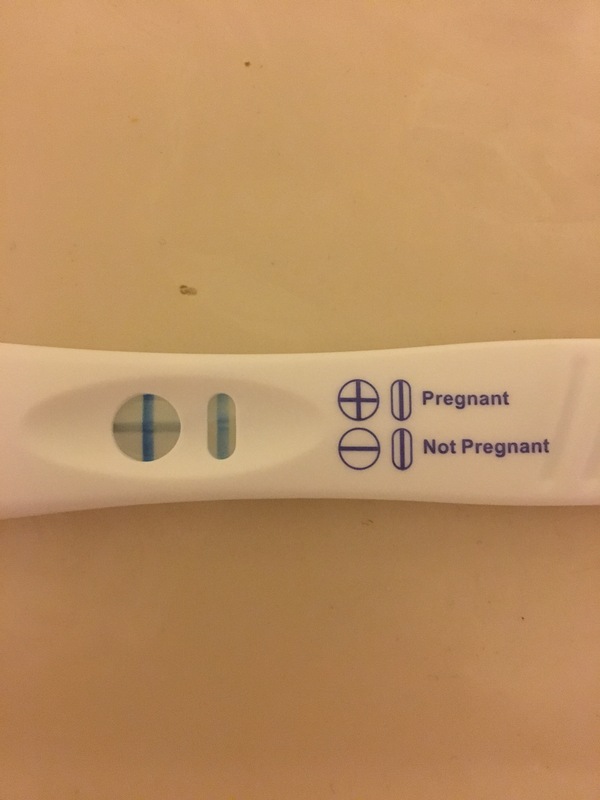 I wasn’t really pregnant, was I? The next morning I was on the phone with my BFF before 5am. We talked and later that morning she met me at work with chocolate, coffee, a gallon of water and a slew of pregnancy tests. I went through them. Positive. Positive. (Oh my gosh. Is this really real?) Positive. (I am SO pregnant and my baby will be a big brother at 13 months.) Positive. That’s it. Is this real life? Wait, this IS real life. That is a LIFE growing inside of ME. How did this happen? Wait, I know how it happened– but how did it happen to me? We have been married for SEVEN YEARS. Seven! I had dreamed of this, but given up hope. It stopped mattering because we have our son and he is perfect and amazing and the best thing that had ever happened to me. But now, now is this new thing. I swear, I floated out of that office. I called Ryan. I texted my best friend. I was allowing this incredible force of joy to sweep over me. Sure, it was unexpected. 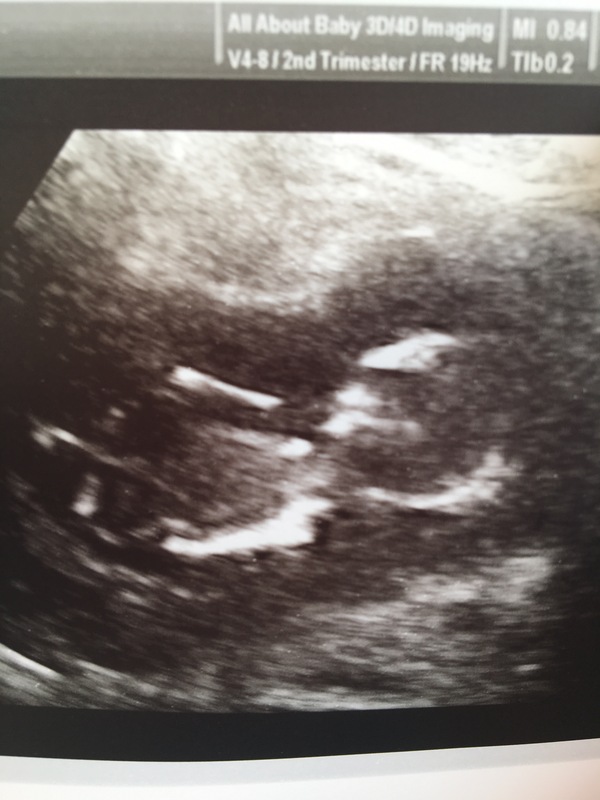 Certainly it was unintentional, but we were growing our family and I was OVER THE MOON. I floated over to the lab to have blood drawn. Ryan left work. We told our parents because I couldn’t contain my excitement but agreed we wouldn’t tell another soul until later on. I was starving since I had been too nervous to eat. Ryan dropped Dax and I off at home and went to pick up a (very) late lunch. Ryan came home and I was in hysterics crying. I was bleeding A LOT. I called my doctor and they told me to come back in. Things are… confusing?at this point. My images look the same but everyone agrees that things are likely not good. Because I am very early in this pregnancy, the only thing to do is wait until my new labs are drawn Friday and go from there. Before you read this entry, I need to share my heart here. What I’m writing here was absolutely the most difficult moments of this journey, and possibly of my life. While I didn’t experience physical labor, I consider this part of our journey to be my own “labor.” This is our part of this story. Keep in mind there is a whole other part to this story that I’ll never be able to share, because it’s not mine to share. While my end was painful, I know that the other part was equally (if not more) painful. Dax’s birth mom is a beautiful, strong, selfless woman. As a family, we speak of her with kindness and love in all circumstances- including this one. Ryan and I made it to our room and figured Dax would be over with us shortly. We were both exhausted and hadn’t slept in over 24 hours at this point. Ryan very uncomfortably stretched out on the sofa in our room and I sat up in the bed. I couldn’t sleep. I couldn’t WAIT to see Dax again. I sat there sending pictures and texts to our closest friends and family. Time passed, Ryan was sleeping and I was getting restless. My mind started to race. Had “S” changed her mind? How would I ever recover if she changed her mind? Was something wrong? Did “S” experience complications? Did Dax experience complications? Was I over-reacting? I was so tired. Kandi had gone with “S” and Dax, and I told myself that if something happened she would have let me know. I waited awhile longer. Ryan was still sleeping. I was still texting my friends and family. Panic set in. My mind was overwhelmed. I couldn’t chase away my fears so I decided to text Kandi just to check in. I played it cool. At this point 2-3 hours had passed. I finally heard back from Kandi and she told me that things were “ok” and to get some sleep. I wasn’t buying it. My head was telling me that “S” had changed her mind and that we would be leaving the hospital without Dax. I mean, how could I blame her? I couldn’t. She carried this precious boy for 9 months. She went to doctor appointments, heard his heartbeat, felt him moving inside of her. She saw his beautiful face and experienced the pain of childbirth. She held him and kissed him. The simple fact that she chose to carry him instead of aborting him proved to me that she loved him. I couldn’t blame her if she changed her mind. I didn’t blame her. I understood. I just knew that considering this as a possibility was breaking me. Ryan was still sleeping. Thankfully I had been texting my sisters and 2 close friends about what was going on. I think the four of them sensed my distress and kept me talking. It was at that point that the tears just started to flow. I couldn’t stop crying. It was the ugly cry. I literally felt my heart shattering inside of my chest. I sat in the bed praying and crying and begging God for me to be able to be Dax’s mom because in my heart, he was already my son. I’m intentionally leaving out some details here out of respect for “S” and her privacy as well as our privacy as a family. The next few hours brought a lot more tears, some conversations, lots of prayer and after nearly 7 hours of waiting and wondering Dax was back in my arms. I missed him more than I thought possible. Having him back in my arms gave me such a peace. We spent some time together and then “S” was released to go home. When she left, my heart broke all over again. My heart melted because Dax had independently laced his tiny fingers together and looked as though he was praying right along with us for “S”. I felt selfish that I was so sad that I had missed out on those 7 precious hours. I hadn’t really taken the time to truly consider her feelings and her experience at that moment. My heart grieved for her and the sacrifice she was making by leaving Dax with Ryan and I. I had missed out on 7 hours, but she only spent 7 hours with him. Honestly, I have no idea what that time between her and Dax looked like. I don’t know if I want to know what it looked like because I know it would crush me. With adoption, most people consider the joy of the adoptive family. Let me tell you, there has been JOY in my heart. But, there is also a huge element of loss. While I am celebrating the greatest moments of my life, Dax’s birth mom is grieving a loss that I could never imagine. Our joy is a direct result of her pain. I am so thankful for “S” and the gift she gave to us. I’m so thankful that she chose the gift of life for Dax. In hindsight, I am SO thankful that she was able to take that time and spend it with Dax. I’m sure she had things she wanted to tell him and kisses she needed to give. That separation was painful for me, but the separation for her has to be a million times more painful. We still pray for her every day and will continue to do so. Dax was with us and we still would be at the hospital for another night so we settled in to our room and took turns changing diapers and snuggling our boy. I finally got a little bit of sleep and the next day it was time to be released. We knew we’d be spending the next week or two in Arkansas and would be driving a few hours for our stay. There was also a 5 day window in which “S” could change her mind that was a constant voice in the back of our heads. On The Night You Were Born. Ryan and I were holding hands as we walked into the hospital room. We stopped briefly outside the door to pray. Then, we went in. It was the scariest, most exciting, most amazing few steps we had ever taken. This was real. Our son was coming. When we walked into the room, we saw “S” in the bed smiling. Sitting beside her was her mother. We hadn’t met her mother yet and knew that it could potentially be a tense situation. However, it was wonderful. We met her mom “M”, said our hello’s, and asked for updates on how “S” was doing. “M” left for awhile and so we sat with “S” and talked. “S” was a trooper. When we arrived she had her epidural so she was feeling GOOD. We watched tv, made some general chit-chat and waited. A few hours later “M” came back. She had gotten gifts for Dax and we opened it. There were some adorable little outfits, a butterfly ornament/pendant that had a lot of meaning behind it and the sweetest little baby book I have ever seen. We talked about how we were feeling and watched tv here and there and waited. A little while later “S” and “M” met my mom and Andy. We all sat in the room together for awhile laughing and talking. We took pictures together and talked and hoped for the future. Around 9pm Kandi arrived and we continued to talk and laugh. Honestly, I could not have imagined a more perfect way to welcome Dax into the world. Certainly there was some anxiety and sadness dancing around the room, but the most overwhelming emotion was love. The love for Dax was evident in every person there that night. It still makes me tear up thinking about it. Early in the morning of September 30th we knew the time was coming soon. Around 2am it was time. Everyone left the room except for me, Kandi and “M”. At 2:50am I witnessed my son enter the world. He cried immediately and I cried right along with him. Undoubtedly this was the most beautiful thing I have ever witnessed. I had the privilege of cutting the umbilical cord. My ha nds trembled so fiercely that I was terrified I would hurt him, but the doctor was so kind and reassured me. “S” held Dax and we all watched him in wonder. Soon, the time came for me to be able to have some skin to skin time with Dax. This was it. I was holding my son for the first time. I can’t even describe to you the feeling. The tears fell again. My heart. I swear my heart had to grow just to hold all of the love and emotion I was feeling. There was such peace in those early morning moments. Such pure, simple, overwhelming joy. I remember holding him and just praising God for this perfect gift. I couldn’t wait to introduce him to Ryan. Dax had no idea at that moment that he had the best daddy in the whole world sitting out in the waiting room just waiting to meet him. I was finally able to have Ryan come in. I was holding Dax. He walked through the door and I put Dax in his arms. His face was priceless! He had this grin that just melted my heart and his eyes were wide and he had this smile that I think literally lit up the room. Last night I realized that I had never asked him what was going through his mind when I handed Dax to him. When I asked him he told me that he was terrified. He knew he was absolutely in love with him, but was trying to not let himself get too attached in case things didn’t work out. It was time for the first bath. This kid had a head full of hair. I didn’t realize how much hair he had until they washed it and combed it. It was so long and beautiful! He was NOT a fan of his bath. As I watched the nurse bathe him, she was such a pro! I realized that I was going to have to do it next time and I was scared! But my fear was soon forgotten by his little eyes peeking out! I swear, he was the most beautiful baby I have ever laid my eyes on! We visited awhile longer. We took turns holding him. My mom and step-dad came in to meet him. It was so beautiful! I was absolutely overwhelmed with emotion and exhaustion. At this point, it was around 6am? I think? The hospital staff let us know that our rooms were ready. “S” had a room to recover in and Ryan and I got a room as well. It was as if I had given birth. It was such a neat/weird experience. “S” decided that she would take Dax with her for a bit to spend some time with him. So we said our goodbye’s and we went to our separate rooms and we waited.